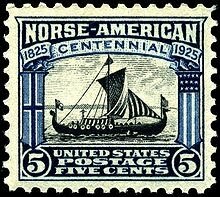 Does it mean anything at all to be a Norse-American? Even if you don’t live in Minnesota, North Dakota or Wisconsin? Most of us don’t speak the language or observe the customs or know the history. Most of us have never been to the homeland (or Lake Wobegon). And my own ethnic roots intertwine with German, Dutch, and English. Of all the Norwegians on Earth, about half live in Norway, half in the United States, a few got lost. “With the exception of Ireland, no single country contributed a larger percentage of its population to the United States than Norway.” The second wave finally made it (ref. to Leif Ericson’s trip to N. America in 1000 a.d. and Norwegian immigration in the 1800’s-early 1900’s). Enough silliness. Oh, did I forget the other squareheads (scandies, vikes, olafs)? One stood on the Moon, one crossed the Atlantic, one Chronicled the Martians, one flew the Jefferson Airplane. I’m impressed. I’d call my ethnic group’s contributions ‘distinguished’. And there are many more not on my list. 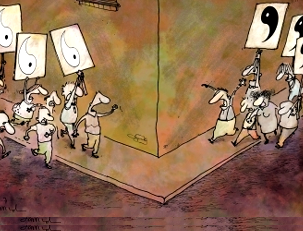 Yeah but, what does it mean? What passes from the roots to the tree? Is my character Scandinavian or just my name? Those roots are stronger than you think. When I was in Africa a friend asked me: “Is it true that there are black-skinned people living in America? Who are they?” But every African-American who’s traveled back has the same experience: Recognition. Returning home after generations. Once I flew to Denmark, Sweden and Finland, and everyone on the plane had my hair! My people. So if I’m not smiling, if I don’t speak much, if I keep my thoughts to myself (not much fun to argue with), if I don’t go for showy sentimentality, I’m hyper-critical, moralistic, melancholy, conscientious, competent, pragmatic, creative and conservative—am I those? sort of—it’s because I silently but impatiently await Recognition. Mutt: Glad I’m not some herring choker. Jeff: You’re telling me. No sense of humor in those doom-and-gloomers. Mutt: Met a nice blonde Swedish lass once. Mutt: Back to my Swede please. There was once a wise man who loved a beautiful maiden, but she lived in a marsh where his car always got stuck and, besides, her father had a gun, so he never did get close enough to tell her of his passion. However, she had a more energetic suitor who purchased amphibious tires for his car and, when her father was asleep, speedily carried her off. Mutt: Treads rush in where wise men fear to fool. Jeff: Third strike. Grab some pine, meat.